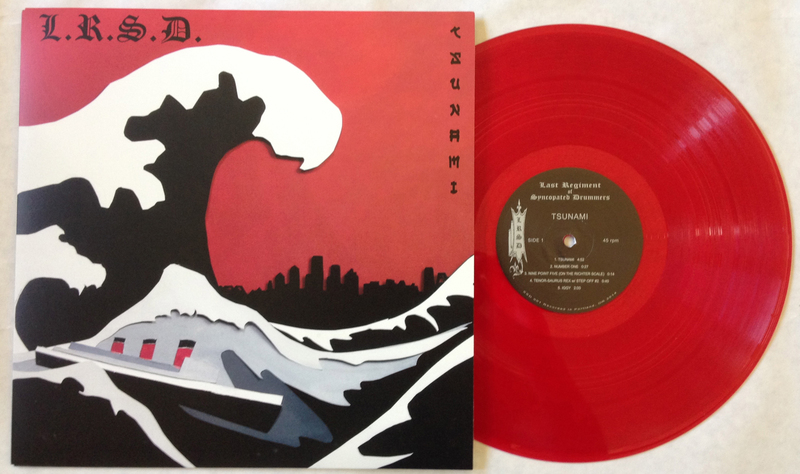 Our new album "TSUNAMI" is now available digitally, or on old-school vinyl! (Vinyl includes digital download!) $15 for the digital version, and $18.50 for the vinyl (which includes shipping & handling)! You can hear the sound all through Portland, and out into rural Oregon and Washington. When you hear it from a distance, it captures your attention like the pulse of the city and draws you closer. When you see the drums flashing in front of you, the excitement is inescapable. Every year, The Last Regiment of Syncopated Drummers (LRSD) is called upon to "kick off" numerous public and private functions all over the Pacific Northwest. LRSD delivers a high energy, heart pounding and visually awe-inspiring performance… our music engages audiences of all ages, and inspires enthusiasm in even the most stoic bystander! Whether you're celebrating a grand opening, private party, street fair, charitable or athletic event, the explosive rhythms of The Last Regiment of Syncopated Drummers can make any event unique and unforgettable. August 25, 2012: LRSD makes a group pilgrimage to Long Beach, CA to attend the Long Beach Junior Concert Band (LBJCB) reunion, and has the opportunity to play with drummers that originated the syncopated drumming style. January 10, 2012: LRSD performs the halftime show for the Portland TrailBlazers' home game at the Rose Quarter. June 2011: LRSD performs in the 41st anniversary Pride parade in San Francisco, CA. June 27, 2010: LRSD performs in the 40th anniversary Pride parade in San Francisco, CA. 2009: LRSD was included in an essay by author Kathy Pape in the book "CITADEL OF THE SPIRIT: Oregon's Sesquicentennial Anthology - A Merging of Past and Present Oregon Voices and Stories" (page 418, "Different Drummers"); Nestucca Spit Press, 2009. October 26, 2008: this day was proclaimed "Last Regiment Day" by the Honorable Mayor Tom Potter to commemorate the ten year anniversary of the group. The official proclamation is proudly displayed in our studio.